These muffins are probably the best I've ever made! They are so good and flavorful and the easy to make topping takes them up a notch. The whole recipe is easy and SO satisfying and I picked it up on All Recipes. 1. Preheat oven to 375 degrees, grease muffin pan or line with muffin papers. I used a mini muffin pan and mini muffin liners (since I did mini muffins, I actually baked at about 360 degrees). 2. In a large bowl, mix the flour (1 1/2 cups), baking soda, baking powder and salt. In another bowl, beat together bananas, egg and melted butter. Stir banana mixture into the flour mixture. Spoon batter into prepared muffin cups. 3. In a small bowl, mix the brown sugar, 2 tbsp flour, and cinnamon. Cut in 1 tbsp butter until mixture is well mixed. Sprinkle topping over the muffins. 4. Bake in preheated oven for abut 18 - 20 minutes (I did 8-12 minutes for mini muffins) or until a toothpick inserted into the middle of a muffin comes out clean. Enjoy! I made these for a meeting at work and I received compliments on them. Definitely a recipe I'll keep and make again. In other news, I got to see Darren McGrady speak at a charity luncheon I went to for work on Friday. He's known as "The Royal Chef" an was a chef for Queen Elizabeth II of England and was requested by Princess Diana to be her personal chef after she and Prince Charles split. He's been on Larry King Live many times, Fox News, the CBS Early Show and CNN covering the Royal Wedding, not to mention the many programs in England and Europe, where he's from. He has also cooked for 5 US presidents. He now lives in Dallas and works as a personal chef, author, culinary consultant, event planner and public speaker. 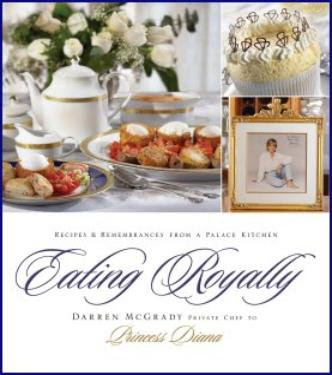 He has his own cookbook (Eating Royally) and shares many of Princess Di's favorite recipes and many of his memories with her and her sons Prince William and Prince Harry. It was seriously amazing hearing his personal stories and memories with her and made many women at the luncheon teary eyed hearing what a loving, giving and compassionate woman she was. One story: a woman and her little boy were invited by Princess Di to come over for dinner. The woman had written a letter to Princess Di as her son was dying of cancer and he wanted to meet the Princess. So Lady Di asked Darren if he could make a nice meal for them. As it came out, the boy grabbed his chicken drumstick with his hand and took a bite. His mother was horrified to see him grab his food with his hand at the royal table. Without missing a beat, Princess Di grabbed her drumstick with her hand too and took a bite to make him feel comfortable. Isn't that great?! Today, Darren carries on with many of the charities and types of charities the Princess supported to carry on her legacy. It was an honor to hear him speak and also to remember the great Princess Diana.